Western blot analysis of extracts from CML-T1 leukemic cells using Phospho-c-Abl (Tyr204) (C42B5) Rabbit mAb (upper and middle) or c-Abl Antibody #2862 (lower). The phospho-specificity of this rabbit mAb was verified by treating the membrane with calf intestinal phosphatase (CIP) (middle and lower) before antibody probing. Phospho-c-Abl (Tyr204) (C42B5) Rabbit mAb detects endogenous levels of c-Abl only when phosphorylated at Tyr204. 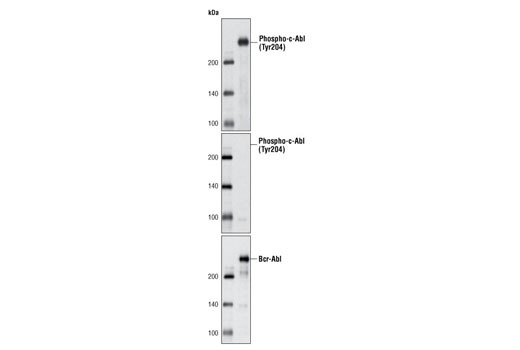 This antibody may weakly cross-react with other tyrosine-phosphorylated proteins. For additional information please visit PhosphoSitePlus®, CST's modification site knowledgebase, at www.phosphosite.org. Monoclonal antibody is produced by immunizing animals with a synthetic phosphopeptide corresponding to residues surrounding Tyr204 of human c-Abl. The c-Abl proto-oncogene encodes a nonreceptor protein tyrosine kinase that is ubiquitously expressed and highly conserved in metazoan evolution. c-Abl protein is distributed in both the nucleus and the cytoplasm of cells. It is implicated in regulating cell proliferation, differentiation, apoptosis, cell adhesion, and stress responses (1-3). c-Abl kinase activity is increased in vivo by diverse physiological stimuli including integrin activation; PDGF stimulation; and binding to c-Jun, Nck, and RFX1 (2,4). The in vivo mechanism for regulation of c-Abl kinase activity is not completely understood. Tyr245 is located in the linker region between the SH2 and catalytic domains. This positioning is conserved among Abl family members. Phosphorylation at Tyr245 is involved in the activation of c-Abl kinase (5). In addition, phosphorylation at Tyr412, which is located in the kinase activation loop of c-Abl, is required for kinase activity (6). Phosphorylation of c-Abl on Tyr204 was identified at Cell Signaling Technology (CST) using PhosphoScan®, CST's LC-MS/MS platform for phosphorylation site discovery as well as another publication using MS technology (7). Meyn, M.A. et al. (2006) J. Biol. Chem. 281, 30907-30916.